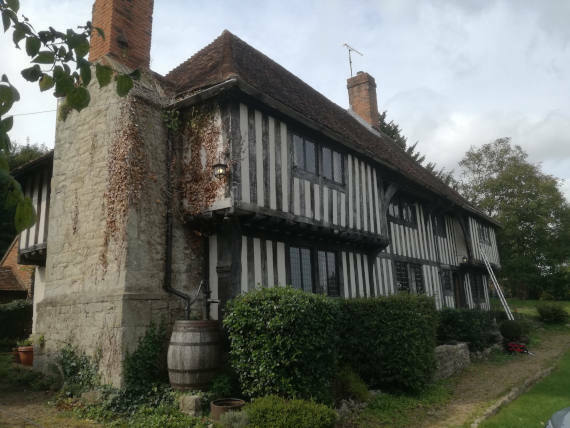 A private client instructed H+R to undertake an investigation into a possible infestation of wood-boring beetle on a timber-framed Wealden hall house in Kent; the client had photographic evidence of what appeared to be frass on a number of timber elements. The house was a recent purchase and the owner wished to be advised on the appropriate course of action to take. H+R investigated the structure for signs of damp and decay and took surface and deep moisture content readings. There was extensive use of cementitious products and silicone sealant on the building preventing the free passage of any moisture in the masonry plinth and in the panels between the timber elements. The investigation revealed an approximate 2m section of decayed oak timber (Quercus robur) sole plate on the front face of the building, and after scrutiny of some carcasses under a microscope identified the cause as death watch beetle (Xestobium rufovillosum). Although a majority of the remaining timber elements of the building all showed signs of historic insect attack, this small section was the only active infestation. Our advice for the remedial works prevented the unnecessary use of chemical treatments on historic fabric whilst still tackling the problem. This included the cutting away of infected timber to be replaced with suitable new material, and the removal of all silicone and cementitious material from the faces of the building allowing the historic fabric to ‘breathe’.